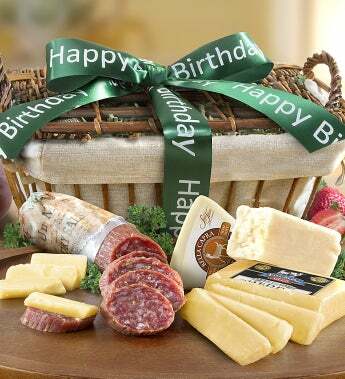 Give a delicious birthday gift that's also sophisticated and satisfying—a pairing of San Francisco-crafted Volpi Italian® Salame with premium Cheeses from the fertile California wine region. All natural and expertly created, hand-tied Volpi Italian® Salame perfectly complements the Fiscalini Cheddar and Sierra Nevada® Traditional Goat Cheeses that are made using time-honored traditions and techniques. No herbicides or artifical fertilizers are ever used. Arrives in an elegant willow basket with twill liner. It’s pure heaven for your favorite foodie. Give a delicious birthday gift that's also sophisticated and satisfying—a pairing of San Francisco-crafted Volpi® Salame with premium Cheeses from the fertile California wine region.